Be sure to list your size in Comments section. European style shank with a flat face, and on the shank is a ribbed pattern. This ring is super comfortable to wear. The top of the ring is 7.55 mm wide, and it tapers down to 4.66 mm in the back. Sterling silver. 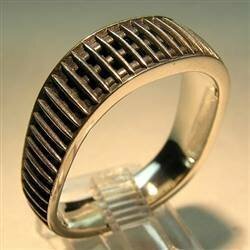 Design Notes: I designed this ring for my brother Stephen. I wanted to do a band ring that was simple, yet elegant, and I happened to be doing a lot of research on Vikings and really loved the way their ships looked when they were just the skeleton and all that was exposed were their ribs.